There is certain intelligence to animals that can captivate you with their gaze. Owls happen to be one of them. Those who have seen an owl have been enchanted by their gaze forever. Hardly anyone ever forgets seeing their first owl. I’ve mostly seen them in their natural habitats– where they belong – blissfully sitting still in the afternoon sun only to become active during dark, and unfortunately, I’ve seen them where they don’t. 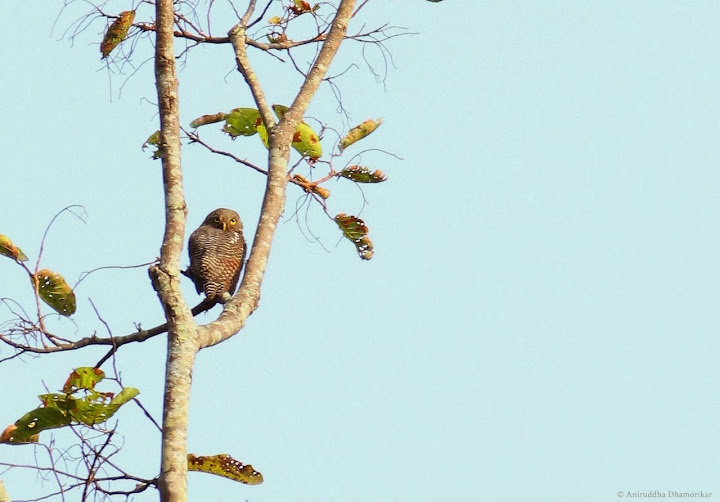 The ruckus of Jungle Owlets, a he-owl calling a she-owl, is omnipresent where I live. It is also the most pleasurable to hear, and mystic. Then there are the Spotted Owlets, the phantoms of the night, with their large bulbous eyes they look at you in perseverance. They sit by the streetlights at night and in their wooden caverns by day. 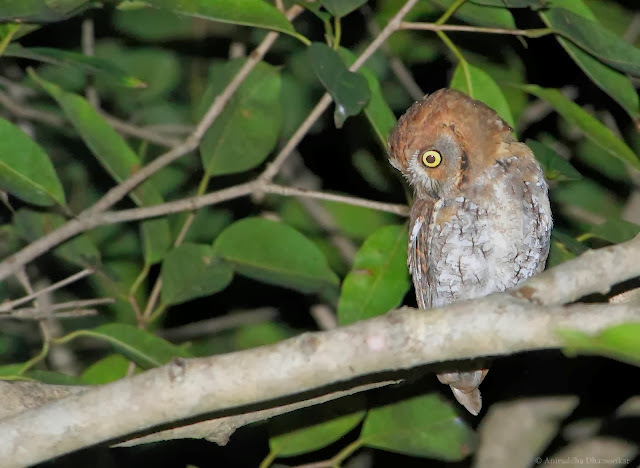 And there are Collared Scops Owls, the fairies of the dark, with their cautious deep dark eyes and tufts of horns, sprinting from branch to branch. All of them, in the day, would be solemnly sitting in their respective abodes – setting up homes and bringing up families at the edge of human settlements. in the village, and have let them live unharmed so far. The first of my discovery of owls was in my childhood when a large (larger then) Barn Owl entered our premises and sent every one of my friends home in terror. By luck or fate, the owl entered our neighbour’s home, and I remember his eyes, with a gaze that passed right through me. We let it rest there until sun down. 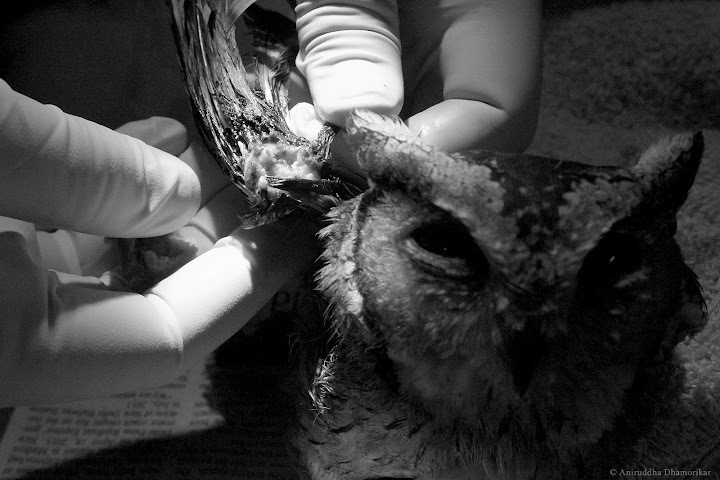 On another occasion, another Barn Owl was found exhausted and terrorized by crows, which after a peaceful few hours of twilight recovered and flew off at night. People have, on both these occasions, called them a bad omen – for me they were the dark knight of the cities, flying silently from one side of the street to another. What’s so daunting about them that makes one want to have them killed, or in magic pots, and as exotic pets? 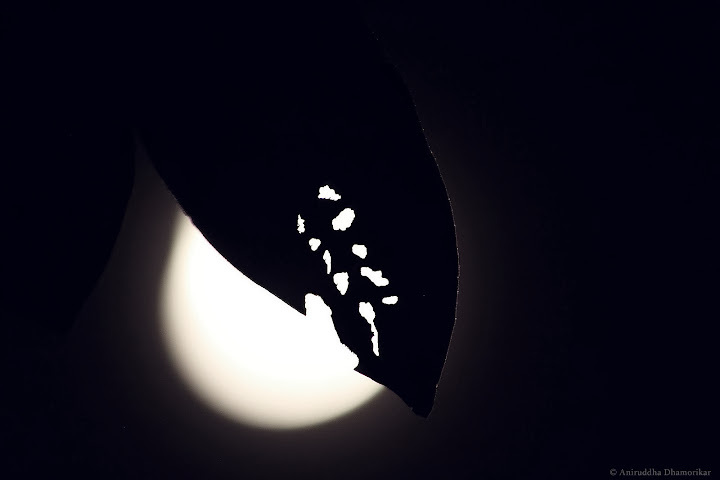 At the end of the night as new day’s light casts a blue sky, they return – they always return – to their habitual abodes – mostly hollows in old-growth trees or trees with dense foliage. Some have spent generations just beyond the reach of man – but not all who know where they dwell are friendly. 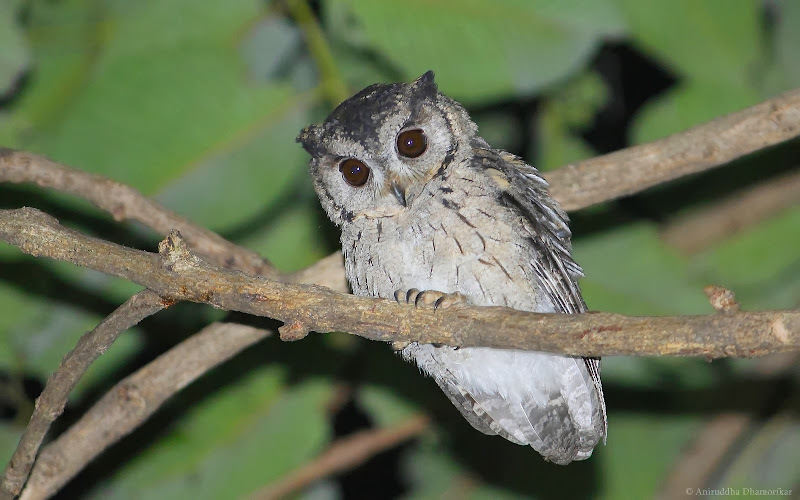 I discovered a little fraction of this trade in January when a colleague of mine rescued a pair of Collared Scops Owl from the clutches of villagers in the forests of Central India. Their wing-bones had been clearly broken. 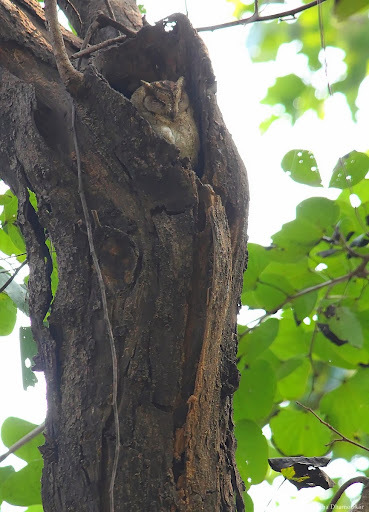 In Abrar Ahmed’s report, Collared Scops Owl ranked fifth in the frequency of occurrence of Indian owl species observed in trade (pp. 18), preceded by Jungle Owlet, Rock Eagle-owl, Barn Owl, and, the most hunted, Spotted Owlet. under the Wildlife Protection Act of 1972. Although superstitions and traditions are sternly believed and followed in remote communities for generations – probably dating back to several decades or possibly centuries, the blame put upon them for hunting and marketing is justified by the fact that most, if not all, know the ramifications of hunting wildlife in today’s times. It is therefore a serious crime not only because it is saturated with dark superstitions but also because it is the least undocumented underground trade-networks benefitting from these superstitions. The two owls which could have ended up in a broth of mysticism constitute an insignificant number of owls and other birds hunted for black magic, but they were the victims of it nonetheless. During the course of days we discovered that one of the owls was a fledgling, while the other was an adult, probably the mother, who later lived to see the stars above her head and wind under her wing. Over the period, though, I learnt a great deal about owls, about their mellow, peaceful, yet wild, nature. Over the days I grew fond of them both – it was more than pity towards them. I did not want them to merely survive although I debated against the fact that life is valuable, but it is valuable only when it is allowed to live on its own terms. Under the guidance of experts and friends, medicating and feeding them became our priority. Madhya Pradesh is one of the principal Indian states where actual trapping of owls is organized, ranking second to Uttar Pradesh (Ahmed, 2010). This could be because a number of tribal communities living in the area are traditional hunters, which have now seen the flair of economy that hunting brings to them. The grimness of this situation is probably best described by Ahmed, “Sometimes Spotted Owlets were dyed (with tea-leaf water, Acacia catechu extracts, or lamp-black mixed with mustard oil) and feathers struck with latex to the head to make the bird appear horned. Red colouring was also sometimes inserted into their eyes to alter their yellow eye colour so that they appeared like the larger horned owl species.” (Pp. 20). 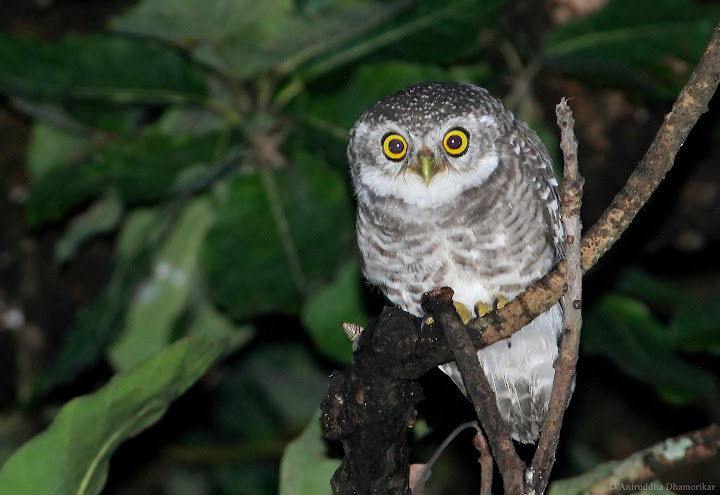 The most common owl of India, the Spotted Owlet ranks first amongst the most exploited owl species in India. The TRAFFIC report clearly details the magnitude of the trade of owls in India, but also the desperate attempts made in order to make quick money. What lies in the centre of this activity is the demand for owls. When a living being is price-tagged, it is done so to lure customers who can afford to pay the price. In context of owls, which are sold in a range of Rs 200 to Rs 4000 (Ahmed, 2010, pp. 38), the customers primarily come not from the hunting tribes but from well-to-do families wrapped in false beliefs, superstitions, and, disturbingly, infatuation. If it is their charm that makes people want to keep owls as pets, it is also their curse. An article in BBC talked about an increase in people in India demanding to buy owls irrespective of their legal protection. Mr Jairam Ramesh, the then Minister of Ministry of Environment and Forests, blamed “fans of boy wizard Harry Potter” for their role in the dwindling number of wild owls, quotes the article published in November 2010. Probably the most infuriating quotes from Harry Potter series, albeit its innocent intention is, “Harry now carried a large cage that held a beautiful snowy owl, fast asleep with her head under her wing.” - Harry Potter and the Philosopher’s Stone. Curiously, and equally disturbingly, Huffington Post in May 2012 highlighted an increase in abandoned pet owls in animal sanctuaries in England, saying, “Harry Potter fans enchanted with the boy wizard’s owl sidekick Hedwig drove up demand for the birds during book and movie releases […] now that all book installments and film adaptations have been released, many owners are abandoning their pet owls into the wild, where they are unprepared to care for themselves.” What’s endearing is that the author J. K. Rowling made strong pleas to fans to discourage keeping owls as pets. as displayed by this Brown Fish Owl. In Indian mythology, owl is the vehicle of Goddess Lakshmi (the Goddess of wealth). According to the TRFFIC report, they are most sought-after ahead of Diwali for ritual purposes, and is traditionally sacrificed on auspicious occasions, or to become prosperous through heinous ways. From the eyes to the claws, almost all the parts are consumed in bizarre rituals. Today, law is the only means to curb this menace, for stopping people from believing in superstitions will require a cultural shift and a change in attitudes which will take several human-generations to realize. I often feel exhilarated to sight an owl on a nature trail. With their supreme camouflage and stealthy behaviour, they have evolved over millions of years to become perfectly still and silent. To seek them in their natural surrounding is therefore a challenge. Yet if you sit quietly on the nights, you will be able to hear the conversations that owls have. Whether it’s a hoot, a whoop, an eerie tune or a ghoulish scream, owls are expressive in the cover of the night and a delight to listen to. Now when I think about the Scops, I wonder what they would have to say about mankind. I’m certain that they hate humans for more valid reasons than mere superstitions for one. 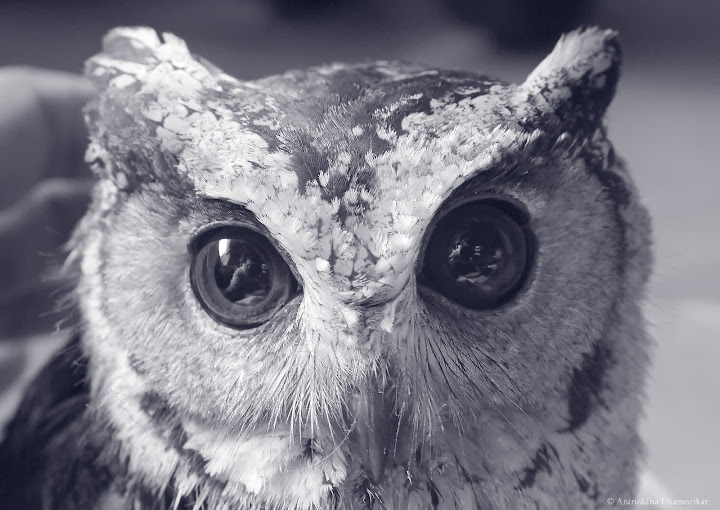 What I intended to do was to undo what my species did to theirs, but somewhere I failed, for the Scops would never live the same life she led, even when today she is a free owl. What they would say about mankind would be too embarrassing to talk about any species. I learnt it by listening to her threatening hiss and snarls… that she did not like what was happening around her. But we respected that, for the intention was never to tame her but to set her free. The owls are in danger. There’s probably not a great deal that many of us can do, except by being aware of this other thing about owls, the fact that they are hated (or prized) for ridiculous reasons, amongst things which have made owls our favourites. I would recommend you to read the detailed report published by TRAFFIC on the illegal owl trade in India; to keep an eye out on any owl residences in your area; and to record and inform the authorities and wildlife rescue NGOs (especially the latter) if you find captured owls or a person keeping pet owls. The pleasure should be in letting an owl be an owl, and an owl is an owl only when it is free. To the point of infinity - Why have your posts become so infrequent? To the point of infinity - I love the 5th pic. Is it taken by you? The photographer's clear reflection in the curious eyes make this pic so different.